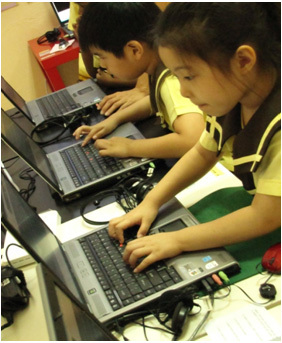 ICT has been successfully integrated into the primary school education curriculum. Therefore, our programme aims at engaging the child in a continuous critical thinking process through multimedia projects which will prepare them for future ICT challenges in their formal school years. Stimulates your child’s interest by creating fun, lively and colourful multimedia presentation through a series of project works. Equip the children with basic IT skills – Word processing, keyboarding, graphic drawing designing skills as well as movie creation and slide show presentation skills. To cultivate children’s thinking, communication, problem solving and analytical skills through software exploration and the creation of multimedia presentations. Develop children’s linguistic ability and acquire mathematical skills, life science and exercise creativity & imagination. Enable the children to learn about team work skills. Enable the children to think “Out of the Box” - Learning, Knowing and Applying.